"I was happily surprised when the scholarship made the cost of attending Cazenovia closely match the expense of a SUNY school." Cazenovia by way of Manhattan: completing the four-year degree. Hannah Gray's interest in fashion was sparked in middle school with fashion magazines, runway shows, and picking out clothing and putting outfits together. It rapidly grew into a passion. She is keen on business, and started to think about combining business with fashion for her career. Hannah heard about Cazenovia College when she was researching schools in New York state that had reputable fashion programs. She shares, "I really wanted to collaborate my interest in business with my passion for fashion." She visited the College her senior year of high school and enjoyed the experience, but decided to go to SUNY Fashion Institute of Technology (FIT) in Manhattan, graduating with her associate degree in fashion merchandising and management. Hannah then faced a decision: should she finish her four-year degree at FIT or transfer to experience another school? This question precipitated a return visit to Cazenovia College. This time, the moment Hannah stepped on campus, she knew Caz was where she belonged. The small class sizes and emphasis on interactive learning were welcome changes. "I learn best and thrive in a hands-on atmosphere, where real-life situations are brought into the classroom, and that's what I found at Caz," Hannah shares. "The professors truly get to know students, and care about their success," she adds. As a transfer student who was planning to commute from home, ensuring a smooth transition to Cazenovia was important. The Admissions Office—and in particular Kate Harris—ensured that this was the case. Hannah shares, "Kate brought me around campus multiple times and made sure I was fully prepared." 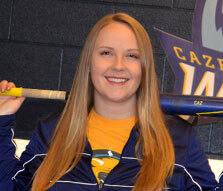 Equally important, Hannah received a transfer scholarship offer from Cazenovia. "I was happily surprised when the scholarship made the cost of attending Cazenovia closely match the expense of a SUNY school," says Hannah. "The affordability was definitely a factor in my decision," she adds. Hannah interned the fall and spring semesters at Plato's Closet. The internship helped her to further develop the skills that she learned in fashion and business courses. Hannah absorbed visual merchandising, styling, social media marketing, and small-business tactics from the experience. As a senior, her capstone project is working on the College's annual fashion show as a team leader (along with two other seniors) on the model and merchandising team. After holding auditions and selecting the models, Hannah and her fellow team leaders are responsible for providing coaching to the models–with practice every Monday and Wednesday, choreographing the runway show, fitting designers' garments to each model, and coordinating hair and make-up to match this year's theme "Modern Masquerade." Hannah will graduate with a bachelor of professional studies in management, with a specialization in fashion merchandising, in May. She is currently applying to jobs in management, styling, and merchandising, and feels like she is ready for any position in the fashion industry–a true sign that the hands-on and real-life learning at Cazenovia College has prepared Hannah for real-life success.